Susan of The Bicycle Garden commented on my previous winter-whine post (not that long ago, maybe just over a week?) that snow has been like a bad penny for me this year. I think this is true for the entire population of Seattle (with the exception of the ski crowd, of which I am not a member), and probably Portland and Vancouver too as well as everyone in between. Even a majority of my daughter’s kindergarten class voted recently that they are tired of snow. 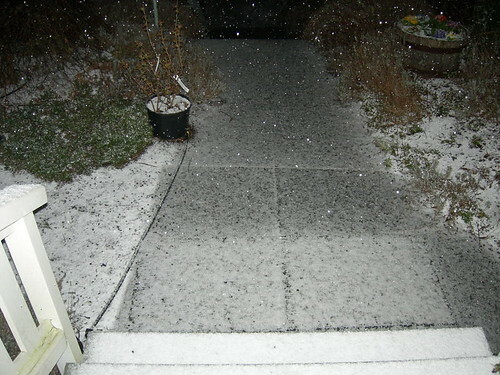 Tonight’s storm started with sleet, moved to snow, and threw in a little thunder and lightning for good measure. And of course I forgot until it was over to go and shelter all the nice little plants I bought yesterday at the nursery. Oops. One of the flats is visible in this photo. I fully realize the futility of railing against weather. But if we are going to have to put up with so much of this white crap each succeeding winter, I’m going to have to think about moving back to California! 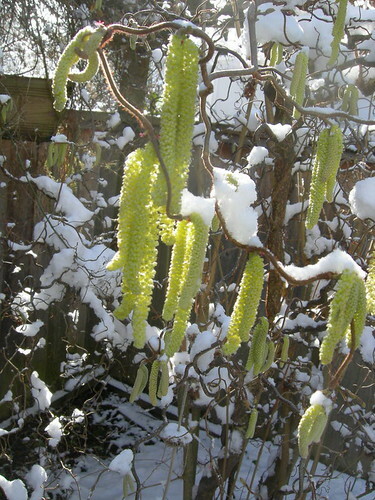 Just when we were shedding our woolly scarves and pondering more tender plantings, winter came back with a wee-hours blast last night, dumping two inches of snow on Seattle and pushing dreams of spring gardening a little further into the future. Yeah, yeah, I know, two inches – big deal. We are whiners here, we know. But it’s been such a weird winter, with a seemingly endless procession of freezing weather, that it’s starting to make me feel like spring will never truly arrive. Oh, I was fooled for a while last week. 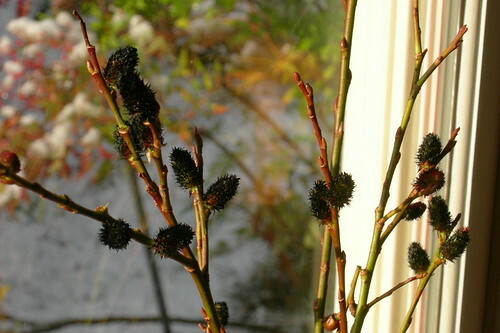 The sun came out for days on end, and it was only because I was too busy to garden that I didn’t get out there and do a bunch of tidying chores like whacking back plants that got hit by earlier frosts. I was also feeling really bad about not having been industrious enough to get peas started and out there. I guess my laziness has its benefits sometimes. I hope everyone who was more industrious than I finds that their early efforts did not suffer too much, since everything was here and gone in about 10 hours. 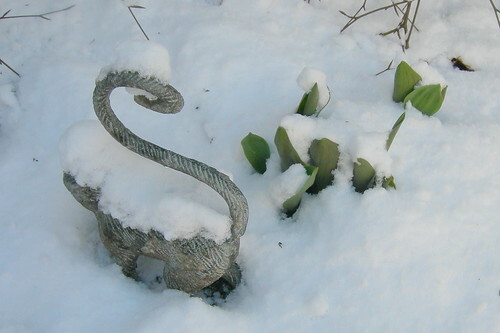 Although I have more snow-garden pictures than my computer knows what to do with (creak, groan, whir – must delete many this weekend), I went out to take a few more today. It made me see some things, even just the tips of them, that I hadn’t noticed before against the bare ground. 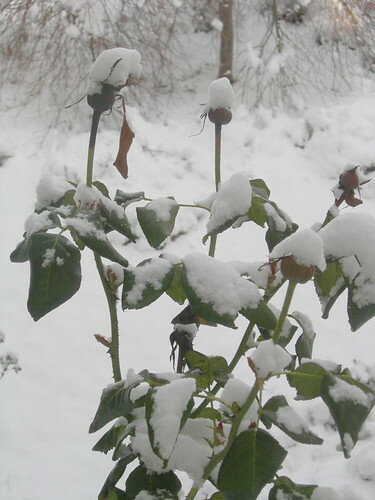 As-yet-unpruned rose bush with snowy “hats” on the hips. 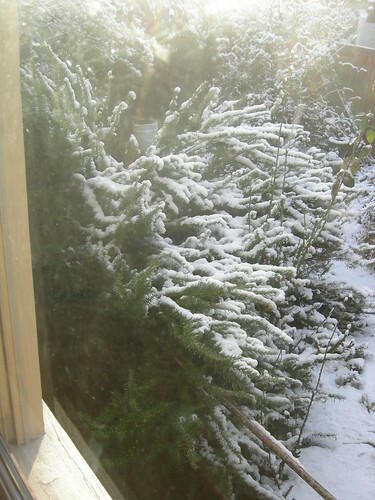 Unknown weeping conifer outside the dining room window. Any guesses? Well, I guess the poppies are up. I hope they stay that way! 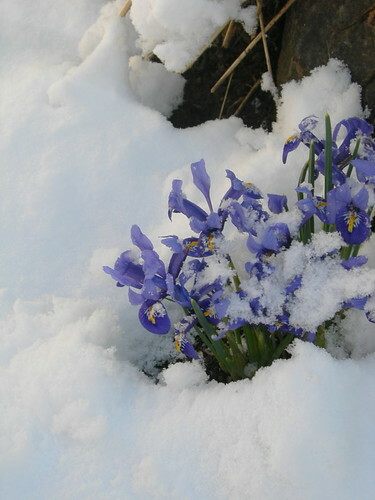 Didn’t notice these dwarf iris were up until my daughter whacked the snowcap off of them. Hey, little garden monkey, thanks for not stepping on my tulips! Yes, I do know Christmas was over two whole months ago! 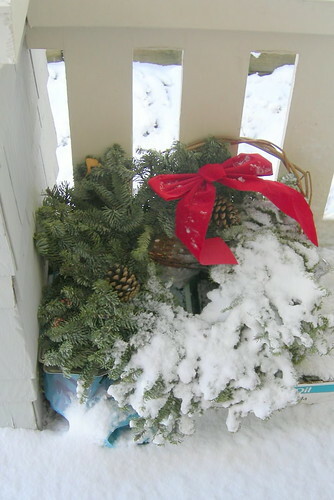 The wreath has yet to make it to the compost bin. This is it. It has to be! Doesn’t it? Who else here is ready for @#$& spring?! 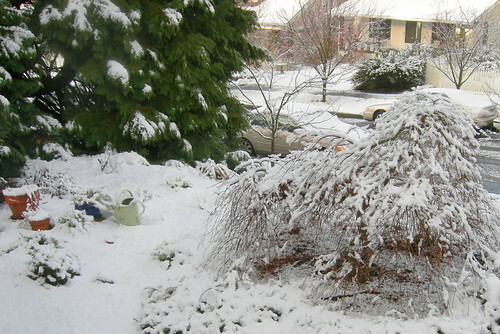 We in the Pacific Northwest sometimes have short memories when it comes to the arrival of spring. 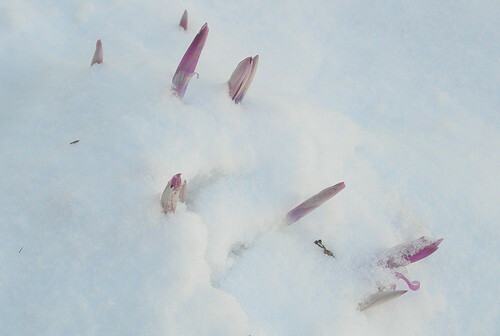 We rejoice in the arrival of the first crocuses or snowdrops bursting forth from the ground and are almost automatically lulled into the feeling that winter has been banished. 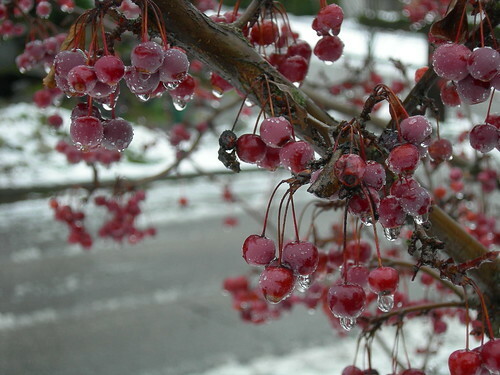 Then, more often than not, another set of freezing temps and a snowfall or two arrives in February to burst our bubbles and remind us that we really do have four seasons, even if they do get a bit jumbled together at times. 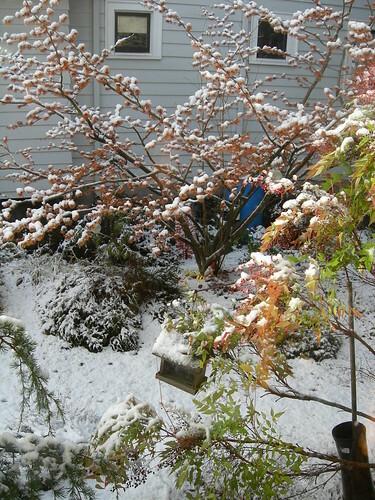 I didn’t plant that dwarf Japanese maple, but I like how it looks with a dusting of snow. School was delayed by two hours but at least it wasn’t canceled. I had a lot to do today so was grateful to Mother Nature for sending the morning sun to start the melt-off going. 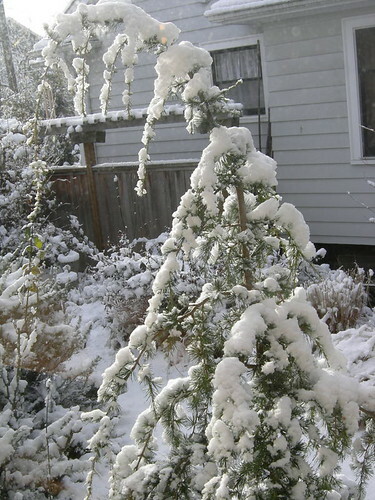 That poor rosemary, if it survives this winter it will be a miracle. Actually, it will probably take over the earth by midsummer unless I do something to stop it! Our city is lovely under a little snow blanket but we don’t do too well when it sticks around. Even with under an inch, there were accidents, bus wipe-outs and bridge closures that backed up morning commute traffic for miles. This place is just not built for snow driving – too many hills, too much ice, no budget for road clearing/de-icing and too many inexperienced winter drivers. 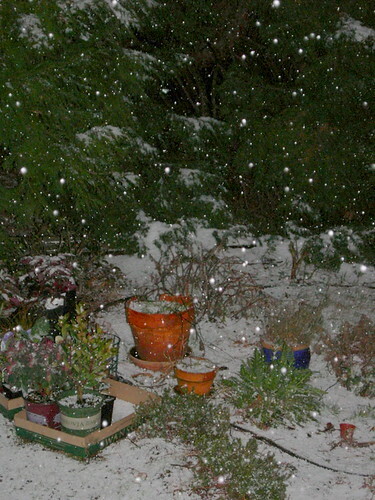 As I type this, we have had a very wacky weather evening starting with hail/sleet, followed by an oddball winter thunderstorm, and now snow is beginning to fall again. 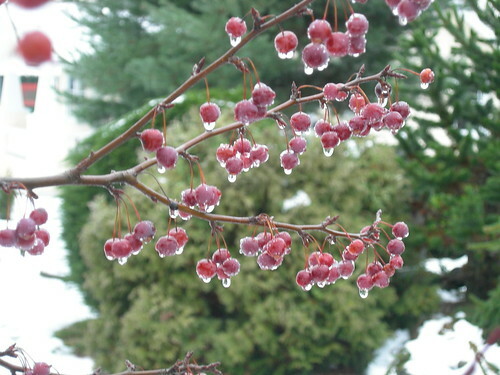 What has Mother Nature been doing to surprise the heck out of you these days? 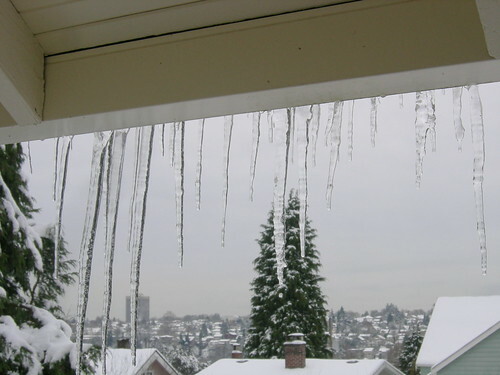 Looking back to last month and re-hashing our snow stories is still a big topic here in Seattle. I bumped into a neighbor in the grocery store yesterday and we had to exchange our tales. Anyone from a truly snowy winter climate would be laughing their tuchus off at our wussiness, but for us the nearly two-week siege of sub-freezing temps and unseasonably immense snowfall really shut the area down for quite a spell. The city of Seattle’s snow/transit response is currently being questioned quite heavily – the Mayor at first gave the city a B grade (when most citizens would agree that it deserved more like an F-), but is now admitting that there needs to be a better system in place for next time something similar occurs. During that time (late December), schools were canceled, bus service slowed to almost nothing, roads were iced over, and people like me who live on steep hills were basically trapped. Even walking was treacherous, as many home- and business-owners did not clear their sidewalks and nobody knows to salt or sand. Normally, I would have just stayed in our nice warm house and come out only to build an occasional snow creature with my kid. But, as it happened, I had a previously contracted music gig that required me to head into the city center every day for the four worst days of the blizzard of ’08. Never a great snow driver at the best of times, having to head in with a borrowed musical instrument in the back of the car added to the stress level quite a bit. And when I got to the bottom of our hill and hit the brakes oh so gently and found that I had hit ice and was slooooooowly sliding against the light into a major intersection just as a bus was coming down the hill towards me (the car finally stopped before it got to scream time, but it was closer than I’d have liked for comfort! )… well, that didn’t help my nerves too much either. As the days went by and musicians’ stories piled up (hours waiting in 25 degree cold for buses that never came, buses that wiped out and had to be emptied of passengers, car wrecks, long frigid walks from miles away), I started to wonder why we were all risking our lives and limbs to provide what seemed like a non-essential service. But the concert presenter was adamant that they had never canceled a show for any reason, so they were not about to provide that option to us. One evening, heading home as the passenger of a Michigan native who was totally unphased by all the weather/driving, we went right under the aftermath of a really scary accident, a bus that had skidded out and punched through the retaining wall, leaving it hanging out over the freeway. Miraculously, nobody was killed, but seeing that struck a chill into my soul and I decided at that moment that I would have to figure out how to avoid driving home the next night after the concert at 11:30pm in the blowing snow and darkness. My solution was to find a discounted rate at a hotel near to the performance site, so that I would only have to walk two blocks after the first concert, and two blocks back the next afternoon for the repeat performance. Yes, it felt a little ridiculous to pay for a hotel just a few miles from my own home, but these were crazy times and crazy methods were necessary! 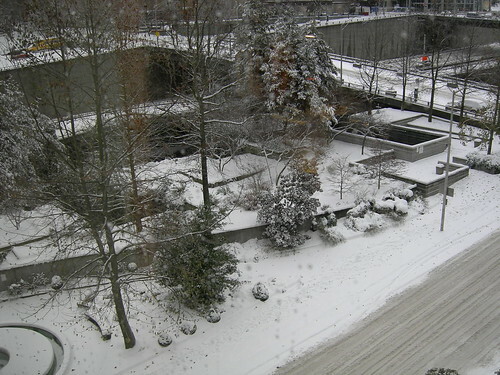 As it happened, my hotel room was fairly low to the street and right on the corner, so it had one rather unlovely view of the freeway, but out the other window it overlooked Freeway Park, Seattle’s 1970s attempt at city beautification through use of gigantic concrete blocks. 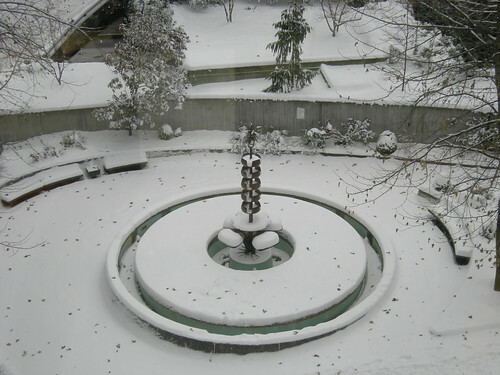 I’ve always found it kind of ugly, but in the snow it looked lovelier than usual. Pre-dating the official park is the Naramore Fountain by George Tsutakawa, a Japanese-American artist and sculptor who designed many pieces of public art and is most known for his fountains. For images of some of them, click here. I really enjoyed having it right out my window. After installing myself in the hotel and admiring my snowy view for a while, I had to get ready to go play some music. 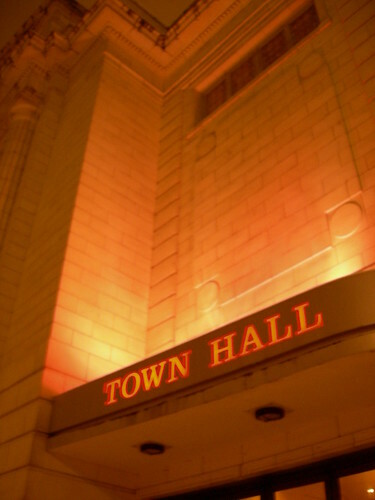 I strapped my big boots and gaiters on over my concert clothes and tromped through the falling snow to Town Hall, one of Seattle’s most venerable buildings. Formerly a Christian Science church, the building was repurposed in the late 90s as a civic center and concert space. Its programming spans many genres and it is well worth a look at their calendar if you live in or near Seattle (or even if you don’t). 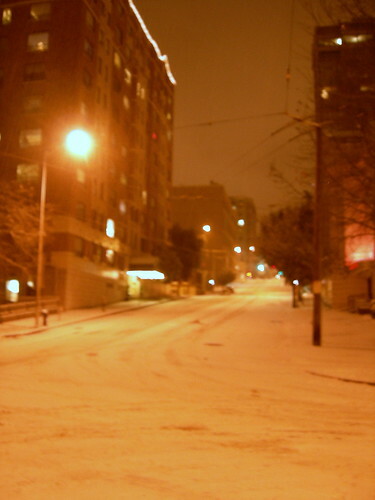 My snowy night-time walk over was kind of magical, the streets were deserted, it was like wandering around a dream city. This is turning into not so much of a “mini” write-up of my small saga, so I think the rest will have to be a Part II. Suffice to say, I still have all my fingers and toes, no frostbite tales here! More stupid snow! The night before school is supposed to start after 3+ weeks of combined sick/snow/vacation time for my kid. Yes, it’s only a dusting in the picture, but it’s still falling, and it’s up to a couple of inches by now. Okay, warmer temps and rain are predicted for early tomorrow morning, but they might not arrive in time to save the school day. They seem to cancel it if they see even one flake at 4am. At this rate, we’re accumulating so many snow days that the kids will be in school through the 4th of July!?! I am writing to you today, December 26, 2008, to respectfully request that you depart from Seattle. I’ll admit, you have been pretty, and with the duration of your stay, a novelty. But you have caused so much difficulty, due to our city’s unpreparedness for this type of winter siege, that I think it’s really time for you to go. Was it not enough that you caused the bus system to become incapacitated and the roads to be covered with ice, therefore preventing people from getting to work or to see family (we missed Christmas with my folks due to you)? How about all the animals that are having trouble finding food, not to mention the homeless people who are freezing out there and waiting for normal winter temperatures to return? Please, please, please won’t you go away? This is my fifth straight day of stir-crazy house-boundedness! I am so sick of you! 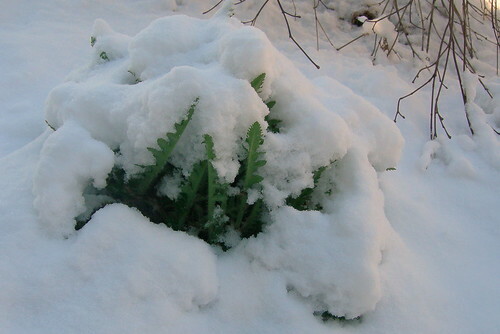 Not to mention worried about my poor frozen plants. I’m begging you, snow, just go. And don’t leave a bunch of flooding in your wake, okay? Because that would just be more than too much.